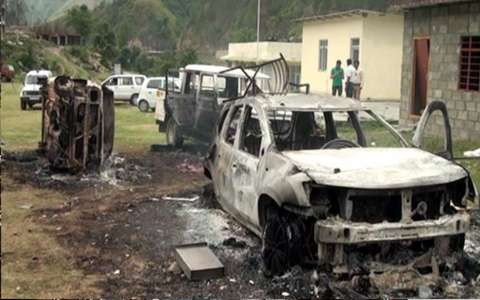 Home/Sikh News/4 Sikh Labourers Dead, Over 10 Injured in Clash at IIT Mandi Campus in Himachal Pradesh. 4 Sikh workers were shot and killed in a clash which took place inside the Indian Institute of Technology Mandi ( IIT Mandi ) Campus in Himachal Pradesh. A clash occurred between the laborers and hired gangsters of the contractor named Rajiv Sharma. The gangsters opened fire on the protesting workers killing 4 Sikhs from Punjab and injuring 9 others. Reports have revealed the cause for the strike was over wages. During the clash, 3 vehicles were burned inside the campus. “Today when members of CITU, who were on strike reached the site and asked the other group to join their protest, the private security personnel, who were armed apparently fired from a revolver. This caused commotion and triggered violent protests,” said the DGP. A mob comprising of more than 250 persons carrying lathis and stones, chased the members of private security. They (private security) ran for shelter into nearby nullahs and fields. But, the mob caught hold of two and beaten them to death. Others who fled to the mountain cliffs and jumped into nullahs failed to save themselves. The labourers got angry when they saw workers of a sub-contractor continuing the work in their absence. They argued with the private guards who opened fire and in the ensuing chaos around a dozen labourers were injured. The officials are probing why the contractors men were carrying firearms and whether they had legal permission to do so. The workers were backed by locals. Police officials said that the private guards tried to escape from the mob but were overpowered and badly thrashed, killing two of them on the spot. Two others succumbed to their injuries on way to the hospital. The angry labourers also torched three vehicles. Four injured workers are also in a serious condition. Police have registered a case of murder against unidentified people while the contractor has been charged with attempt to murder, inciting violence and different sections of the Arms Act. Four people have been detained for questioning. Pictures & Videos – Landslide at Gurdwara Manikaran Sahib, Himachal Pradesh. Multiple deaths reported.